CAPTIVA with gulf to bay access , heated pool and a short walk to the beach, PLUS $100+ Exclusive Beach Resort Discounts on Food, Beverage, Sports, Spa and More! Relax and unwind at the beautiful Mediterranean inspired Villa Elena. Located on the iconic Tween Waters stretch of Captiva Island, this house has access to both the private and pristine Gulf beach and the abundance of wildlife in the bay. There is plenty of room for a large family or group, comfortably accommodating up to 10 people. Every one will enjoy the recently updated décor and the open, single story floor plan containing four bedrooms and three bathrooms. The light filled master bedroom has a king sized bed with an en-suite bathroom and French doors leading to the tropical courtyard. Two other bedrooms, one with a queen sized bed and the other with two twin beds also have en-suite bathrooms. There is a fourth bedroom containing two twin beds and a new queen sleeper sofa in the living room. 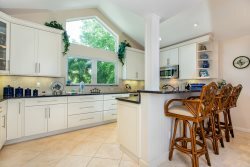 The updated kitchen with granite counters offers plenty of room to gather. You will find it is well equipped for all your cooking and entertaining needs. When your meal is ready, enjoy it in the oversized dining room or in the screened-in lanai replete with a dining table, lounge area and fireplace. A short walk down your shell lane leads to either the beach or the bay. After you’re done enjoying the waves at the beach or kayaking and paddle boarding (which can be rented locally and launched from your semi private dock) in the bay, come back to the house for some relaxation in your private heated pool. Villa Elena has a washer and dryer, gas bbq grill, cable/WIFI, beach cart with beach chairs and umbrella, plenty of pool and beach toys, board games and books. Located very close to the shops and restaurants in Captiva Village Square, and only a short 5 minute walk to ‘Tween Waters Island Resort and Spa, where as renters you have access to all resort amenities. This home is a hidden gem you and your family will love! This is a great property in an excellent location. We loved being within a short walk of the beach and the dock. The cart with beach chairs, umbrella and a stock of beach/pool toys was a big help as we were traveling with 3 small grandchildren. The house was clean and spacious and we enjoyed the screened lanai for many meals. The pool area is very nice with plenty of lounge chairs and an umbrella. We liked the "peace and quiet" of the location, close enough to the village to take advantage of restaurants, etc. but not in the middle of everything. Re/Max responded quickly to our requests for assistance. All in all a wonderful experience! Our only minor concern was the layout of the bedrooms, very close to the main living area and adjacent to the pool. With three little ones, they were sometimes awakened by others in the house. Take a small noise machine if traveling with little ones. Great property! Great family vacation at Villa Elena. A great vacation property. Comfortable and relaxed. Great room well furnished. Well equipped kitchen. Lots of separate spaces for reading and relaxing. Super ! This is a lovely rental home. It is private and quite and the pool is very nice. It does need some updating. The living room furniture is in dire need of replacement and the outdoor living space (the pool area) needs more than 2 lounge chairs. This IS a house big enough for a family. We have stayed her for the past 5 or 6 years and will continue, but we would be delighted to see some minor things addressed. ReMax was awesome! Captiva Island is such a great and relaxing experience. Staying at the Villa Elena like staying in paradise. So close to the beach with all the amenities. We had a fabulous time. The house was wonderful and easy for us to use, even with our wheelchair needs. It was a great week. This home is really a nice location. It is just down the road from the beach. The home is really nice for a family of 6. My only complaint is that there were ant traps around the home & there were quite a few out by the pool. The pool was nice, but a tree drops leaves constantly into the pool, so you can't swim without trying to remove leaves. The decor is beautiful. The location is nice, although you need to be prepared with food, for there isn't anything close by to walk & grab breakfast or lunch-- it would require jumping in your car. Loved this house! It is actually an older home that has been updated but retains the charm of the original house. I can't find anything negative to even say. It was the perfect location for our trip!